"The room looked absolutely perfect"
Wedding Creative were excited to have been asked to be involved with a recent wedding for an upcoming episode of 'Four Weddings'. The popular show on Living TV, now in its second series, sees four couples compete for the crown of 'best wedding', as well as the prize of a luxury honeymoon. The bride-to-be, Jody Simpson, contacted Wedding Creative to help ensure she had the best chance possible of taking the prize. "After watching the first series of the programme I realised I needed to make sure every element of my day was perfect" Jody told us. "As soon as I found Wedding Creative I knew that their venue dressing was going to be a key element of my day". 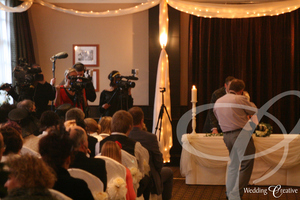 The wedding took place at The Crown Hotel in Bawtry, Doncaster. The stylish Hogarth room was to be used for ceremony, wedding breakfast and evening reception and needed to look fantastic for every part of the day. Wedding Creative designed a scheme that added the ‘wow’ factor that was required without taking away from the already elegant surroundings. The main element of the scheme saw Wedding Creative's new FairySilk wall swags used to embellish the walls of the room while the windows of the room were dressed with fairy light window drapes to create a romantic setting. To complete the scheme a pair of topiary trees was added for the civil ceremony, then to give the room a different feel for the evening, our colour changing up-lighters were used to provide a subtle party feel. "The room looked absolutely perfect" explained Jody "the scheme worked brilliantly as all of the amazing elements came together so well. I really could not have asked for more." The programme will air later this year, and of course we wish Jody every success in winning. You can click here to see all of the photos. Four Weddings is shown on Living TV on Monday nights at 9pm. More information can be found on the shows' website. UPDATE : This episode (Episode 8) aired in May and we are pleased to say that Jody took the prize! We just wanted to say a massive thank you for decorating our wedding venue... it really did make our wedding perfect and wouldn't of been the same with out it.